In the search for answers to questions they are asked by audience members, students, family, and others, many belly dancers have made up stories to explain why certain costume choices are made. Sometimes these theories arose as people began their research and shared what they had learned so far, but then were never updated as further research exposed new information. Fantasy: Belly dancers glue a jewel into their navel. Fact: The idea of wearing a jewel in the navel originated in Hollywood as a result of the Hayes Code. Real dancers in the Middle East normally don't glue jewels in their navels, though there have been some exceptions. Ever since navel piercing became popular in the U.S. in the 1990's, many belly dancers do have piercings with jewelry - but so do many women who are not belly dancers. For more on this subject, read the Dear Shira article about navel jewels on this web site. ABOUT THE PHOTO: This image of Anita Harris' navel jewel comes from the comedy movie Carry On: Follow That Camel. 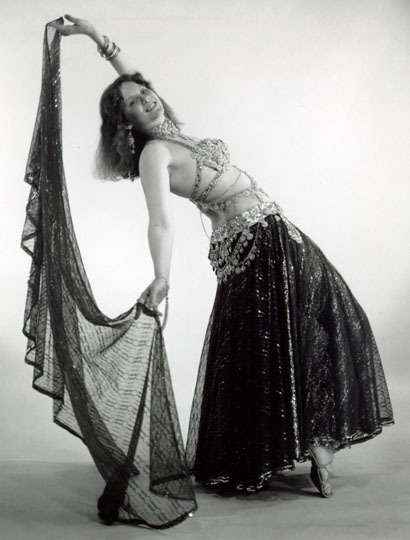 Harris did an over-the-top comedic satire of belly dance complete with enormous navel jewel. Fantasy: The use of coin bra/belt sets in belly dance costuming was invented in the U.S. in the 1970's. Fantasy: The use of a coin bra for belly dancing was invented by Bob Mackie or other Hollywood costume designer for use in the movies. 1942. Bohboh Fi Baghdad (Bohboh in Bagdad). Dancer is Houriya Mohamed. 1942. Aheb el Ghalat (I Love This Mistake). Dancer is Tahia Carioca. 1950. Asmar Gamil. (Dark and Handsome). Dancer is Samia Gamal. Fantasy: The traditional garb for Middle Eastern women was either a coin bra/belt set or a choli teamed with a tassel belt. Fact: Although it's true that coin bra/belt sets were occasionally worn by Egyptian dancers who performed in the nightclubs (see above), the coin bra with a bare midriff is not historical folk attire of any culture. It is a made-for-the-stage costume design. Traditionally, respectable North African and Middle Eastern women certainly would not have bared their midriffs in public. Fact: Cholis were traditionally worn by women in India, under the saris. 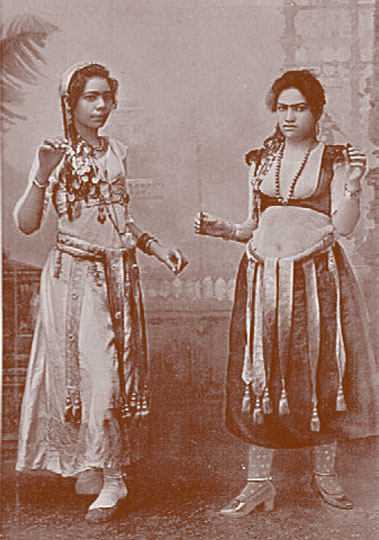 The use of a choli as part of an Oriental dance costume is an American invention — cholis are not part of the clothing traditions of women in the Middle East or North Africa. Over 3,000 miles lie between India and the countries that Oriental dance comes from. Fact: In the Middle East, tassels are used to decorate the halters of donkeys, camels, and other animals. The animals rarely wear tassels on a daily basis — generally, the tassels are placed on their halters just for special occasions. There is no documentation to support the idea that Arabic or Turkish humans wore belts composed of fluffy yarn tassels when dancing. In fact, many people would consider it degrading for a person to wear animal decorations. All of these costume accessories can look really great on dancers, and have been embraced by those dancers who have adopted the American Tribal Style and its variants. They make good theater, but it would not be correct to tell people they accurately portray what historical dancers in the Middle East actually wore. Fact: See the photo to the right and also the one above for an example of traditional clothing style for Lebanon and Palestine. The details of color and how dresses were decorated with embroidery varied from one place to another, but generally speaking traditional clothing covered the body with a loose-fitting cut from neck to toe. Dresses in Egypt and other parts of the Levant were similar in style. 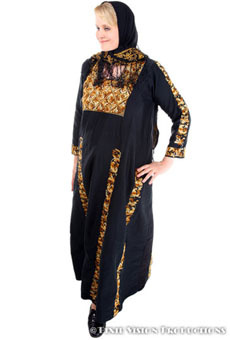 For more information about traditional clothing of the Middle East, see "Dresses in Middle Eastern Dance Costuming" elsewhere on this web site. Fantasy: Samia Gamal was the first dancer to wear shoes for performance. She did it to show that she was wealthy enough to be able to afford them. Fact: Dancers wore shoes to perform long before Samia Gamal was even born. Shafiqa el-Koptiyya was a famous Egyptian dancer whose career thrived before 1900. She was known for wearing shoes with heels covered in a layer of gold and decorated with genuine diamonds when performing at a club called El Dorado. Read more about Shafiqa el-Koptiyya. Fact: The photo at the right shows two Egyptian Ghawazee dancers from about 1920. They are wearing shoes. Samia Gamal is believed to have been born in either 1922 or 1924, after this photo was taken. Fact: In a 1968 interview with Kawakeb magazine, Samia Gamal talked about dancing barefoot. Possibly an incorrect retelling of this incident may have led to the urban legend about shoes. Fact or Fiction: Which Dance History Claims Should You Believe? Separate facts from urban legends.